Now this is a terrific video. 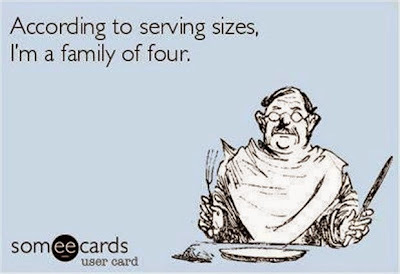 It helps to explain why serving sizes, as posted, can be incredibly misleading. But interestingly, it ends with a call to accept the Australian Dietary Guideline's serving sizes as "right". Personally "right" is a bit ridiculous too. There are lots of variables that affect dietary intake. Sure, I think serving sizes should reflect real world consumption patterns and that having some sort of more realistic reference frame would be useful, but telling people that 12 French fries are a serving, is a recipe to have that person ignore the rest of your dietary advice as well. Have a watch. Truly, it's worth one.